During our Harvest Festival, we always get excited about bringing in our farm animals. Sometimes it's pigs or alpacas and even one year there was an elephant! 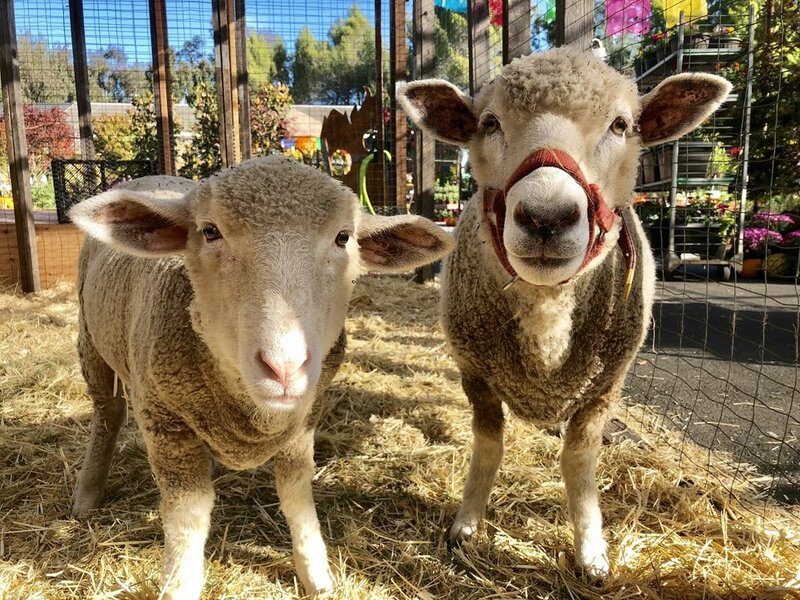 If you were lucky enough to stop by during October this year, then you got to meet our furry friends. 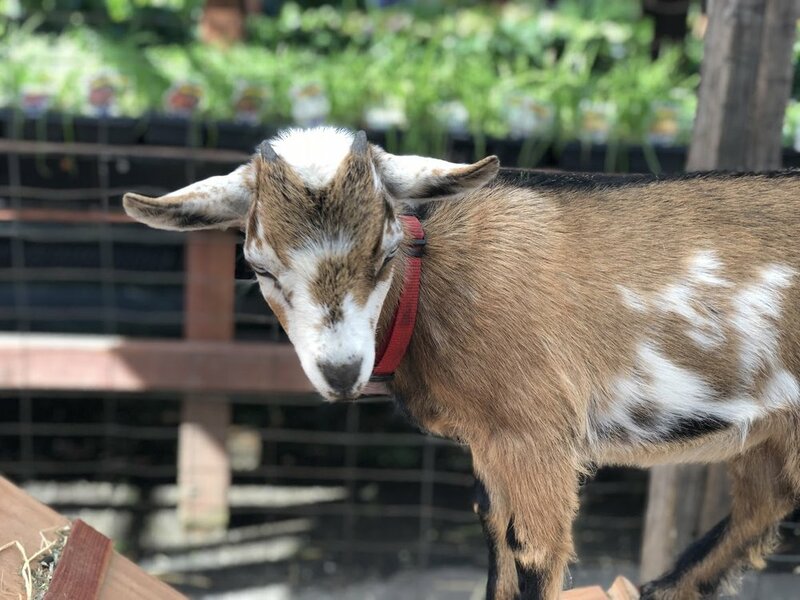 This year, we got a visit from Mama goat Nutmeg and babies Nestle and Nugget, Clara the sheep (baaack for another visit!) with her baby, Noel in tow. And did you hear? Unbeknownst to us, Clara was pregnant with Noel when she was here last year! We also had a gang of chickens and a chick too! Three years ago we met the owners of our animals, Tineke and Torsten Jacobsen. They offered to "rent" us their darling critters for our annual Harvest Festival. When it came time to settle up 2 years ago, Tineke shared that the money would be the seed money for their Rotary project in Uganda. Active members of the Concord/Clayton Sunrise Rotary, the Jacobsen's were spearheading the construction of a medical center for Antenatal, Maternity, Family Planning & HIV Counseling and Testing. The project was complete in 2017, giving the people in that area access to excellent medical care and counseling. Last year, when we agreed to renew our arrangement we found out that Tineke and Torsten were involved in a huge undertaking in San Felipe, Baja California, Mexico. Along with the San Felipe Rotary Club, in support of The San Felipe Cancer Society, they were on a mission to promote early detection and improve hospice care in the San Felipe area. Our “rent” went to the groundbreaking funds of building an annex to the San Felipe Cancer Center that would provide hospice care to patients. We all want to be a good plant parent but sometimes vacation calls, or we get busy, or we get a little worried and a bit heavy-handed and our plants start looking a little sickly. No worries - it happens to all of us. Here are the most common problems we see with houseplants and the remedies to make them happy again! This is the most common problem we see. It’s a bit of “over-parenting” with the watering can in hand. No plant wants to bathe in water, let those roots breathe! The easiest way to avoid this issue is to use a pot with a hole that allows for drainage. If you are realizing this may be occurring with your plant. It’s time to repot with new soil and trim those moldy, rotten roots for a fresh start! Fiddle Leaf Fig leaves will wilt a little when they’re thirsty! Remember that now that winter is approaching you will be cutting back on watering to every week and a half or so depending on the plant, size of the container and how well it drains. Note that if you’ve got a plant near a heater it might call for more hydration than others! If the plant is withering - it’s time to water. For those that prolonged your vacation and are returning home to a sad looking plant - plop it into the kitchen sink or bath and give it a good, long drink. It may be a good idea to give it another long drink the day after depending on how well the soil is soaking up the water. For those who are weary about watering Pothos and Fiddle Leaf Figs are great about telling us when they want a drink. Their leaves will slightly wilt and once hydrated, will perk right back up! Sansevieria and ZZ Plants are low-water houseplants that can go weeks without a water - really the perfect plant for the world traveler! This poor plant was ready for a repot weeks ago! Although plants often only want to move up only 2” a pot size at a time, it’s important to ensure they aren’t root bound. If you’re noticing roots emerging from the bottom of your pot - it’s probably time to repot. Visit us for soil and a new pot and let us help you get your plant a little more comfortable! If you’re noticing brown or black spots on your foliage, chances are your plant is suffering from sun burn. It’s time to back your plant up out of any direct sunlight. There’s nothing you can do for the burned leaves. If they are unsightly, trim them off and give your plant a little R&R in the shade. If your houseplant’s leaves are turning pale and/or yellow and dropping off - it may be requiring a little more light. Most houseplants besides Sansevieria and ZZ Plants require a minimum of sunlight a day to look and live their best life. When in doubt, place your houseplant in bright, indirect light - it is the most common lighting that indoor plants require. We’re got pots for your new and existing plants! For more info on how to revive your houseplants, follow the link here. And as always, come visit us in the Atrium! We’re here to help, whether you need a repotting, a diagnosis or just help finding a new plant pal! If your garden is bursting with fresh herbs now, preserve some for a time when things are not so green. By the first sign of frost this winter, it'll be time to harvest the rest of those herbs in your garden and bring them inside to dry or freeze for later use. Annual herbs can be cut off at ground level but perennial herbs should not be cut down completely, harvest only the tips of branches and tender leaves. Before preserving, wash the herbs gently in cold water, drain thoroughly and air dry on a towel. Air drying herbs double as decor! Gather herbs in small bunches, tying the ends with twist ties or rubber bands. Hang the herbs in bunches, upside down, in a dim, airy place away from any source of heat or moisture. You could use a beamed ceiling or a drying rack, anywhere that allows circulation between the bunches of herbs. It may take 4 – 14 days to dry completely, depending on the type of herb and the warmth and humidity of your drying area. Herbs can also be stripped from the stems and leaves dried in a single layer on mesh rack (window screen works well). Leaves are dry when they are crisp and brittle. The quickest way to dry herbs is in the oven. Set in single layer on mesh rack or foil lined baking sheet. Heat oven to its lowest setting. Place the herbs in the oven and leave until completely dry, which should take two to four hours depending on the herb. Cool before storing. Herbs are dry when the leaves crumble off the stem. Be care to not crush leaves until using them. Once the herbs are dry they should be stored in airtight jars away from heat and moisture. For best flavor, use within 6 months to a year. When using dried herbs, crush between your fingers to release their flavor. Remember that dried herbs are stronger in flavor than fresh, so when measuring in recipes use 1 part dried to 3 parts fresh. Strip the herb leaves from the stems and lay on baking sheets. Freeze until firm and then pack into freezer bags. You can also chop the herbs in a food processor with a little water and freeze in ice cube trays. Once frozen solid, unfold and pack in freezer bags for easy use all year long! When cooking, use the herbs straight from the freezer as you would fresh herbs. Dried oregano ready for your culinary delights! This can be the easiest way to dry your herbs. There are many different types of dehydrators in the market and you don’t have to spend too much. Once dried they are ready to be stored in airtight jars. Our favorite part about dehydrating? So easy to make different herbal blends! It's recommended that you don’t fully crush the herbs up until day of use. We're getting close to that time...the annual harvest! Read on for tips on timing and best practices when harvesting peaches, pluots, plums and nectarines! And hey, this might even help when picking out fresh stone fruit from the grocery! Peaches and nectarines are best when tree ripened, meaning when they're at that perfect point to pluck them off the tree and take that first juicy bite. Peaches ripen from the bottom up toward the stem and from the smooth side toward the split side, so giving them a feel on the upper "shoulder" closets to the split will tell you if a peach is ripe. If it gives a little, it's ready. If it's feeling a little firm - give it a day or two. There should be no green on the fruit and it should come off the branch with a slight twist. Aim for harvesting while still a little firm because as we all know, soft peaches don't store well! But an overload of fresh fruit is always a great excuse to get cooking! Check out this recipe for Roasted Stone Fruit with Shortcake. Plums usually ripen between July and October. Alike peaches and nectarines, they ripen best on the tree. Ripe plums should come off the tree easily with a lift and slight twist. If you are planning to dry the plums, you can let them fall from the tree naturally, but check often as ripe fruits attract pests. Here are some delicious recipes to enjoy your harvest. Perfect for your sangria, sweet tea and other summer drinks - cheers! Simple syrup is a sugar syrup made with a ratio of 1 to 1, sugar to water. In this version, you use 1 cup of sugar and 1 ½ cups water and submerge 8 pieces of stone fruit, sliced to impart more flavor. Bring the sugar, water and fruit up to a simmer, and simmer until the liquid has reduced to the 1 to 1 ratio, and the fruit has given the syrup its flavor, aroma and color, roughly 1-2 hours on simmer. Strain out the fruit and store the stone fruit simple syrup in the fridge for up to 6 months. The syrup can be used in tea, sangria, cocktails, over ice cream, to moisten layer cakes, or made into sauces. Recipe and image via PCFMA. A plant native to North America, the Blueberry is almost the perfect fruit: beautiful, ornamental, easy to grow and contains a high concentration of antioxidants. The trick to growing blueberries is good soil. 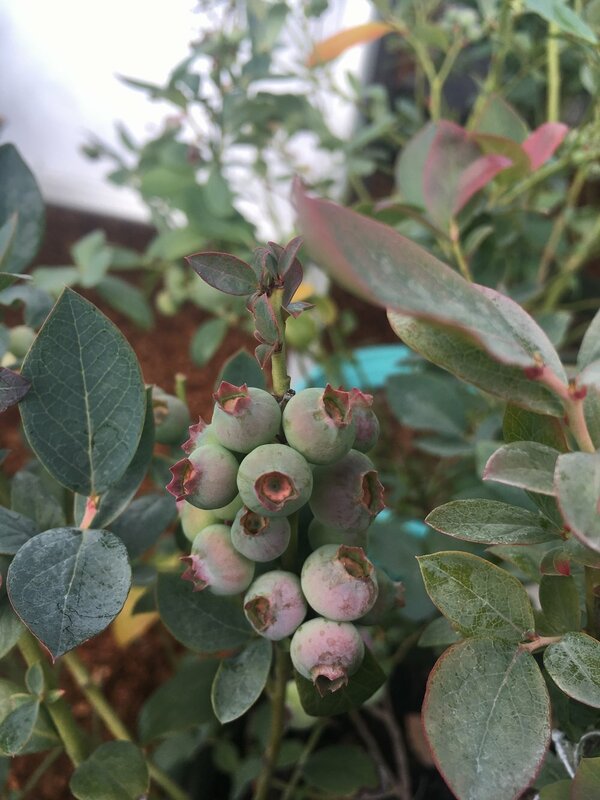 With a little bit of attention to proper soil conditions, blueberries will thrive in the landscape and especially in containers - where you can really control the soil conditions. Blueberries like well drained acidic soils. They prefer a low pH of 4.5 to 6.0 with 5.5 being optimal. They also like to grow in actively decomposing organic matter. To help ensure these optimal soil traits in your garden we recommend planting with Master Nursery Acid Planting Mix. In hotter climates, such as Lafayette and the rest of Contra Costa County, blueberries prefer morning sun and afternoon shade. While in cooler climates, such as Alameda County, blueberries prefer sun all day. Delicious berries just about ready for picking! This means that Northern Highbush varieties should only be grown in Contra Costa or similar counties. Southern Highbush, on the other hand, can be grown in Alameda or Contra Costa - it is perfectly fine for plants to receive more chill hours than needed to set fruit. In spring, apply either E.B. Stone Organics Azalea, Camellia & Gardenia Food 5-5-3 or Master Nursery Camellia, Azalea, Gardenia & Rhododendron 4-8-5. Typically you will want to fertilize once at the beginning of spring and again later in the season. Minimize or restrict fruiting in years 1-3 to encourage vegetative development. Maintain a balance between vegetative growth, root development and flowering/fruit set. Develop the overall plant shape; encourage upright growth, strong canes and an open central canopy. Thin out excess flowering and fruiting to improve fruit size and quality. After your blueberry plant fruits in 1-3 years, it is still important to prune 1-2 times a year. This is will open the canopy of the plant to allow light and ventilation to reach the inside of the plant. This will encourage fruiting in the inner part of the plant and reduce occurrences of foliar diseases. It is also important to eliminate smaller, horizontal branches which produce few fruit and are more difficult to pick. Different blueberry varieties ripen at different times throughout the fruiting season - for our area, anywhere between May and early July. You will typically find varieties labeled as early-season, mid-season or late-season. We always recommend that home gardeners choose varieties with different fruit times to ensure a longer harvest. Blueberries produce more fruit when planted near different varieties so why not take the opportunity to also extend the harvest? A "berry-of-all-trades", known for its adaptability, long bearing season, high fruit yield and disease resistance. So consistent that it is the leading commercial variety in North America. If you want a proven strong performer look no further than Bluecrop. This variety is great for both patio pots or in the landscape. Pink Icing flaunts colorful foliage with shades of pink, blue and green in spring, leaves then turn an iridescent turquoise come winter. Bred and developed over 50 years ago at Michigan State University to be the most cold-hardy blueberry variety. Northland is easy to grow and adaptable to many different soil types. The berries are excellent for jams and baking because of their high sugar content and are known for their amazing flavor with characteristics that are more akin to the wild lowbush species than the other highbushes. A great cold-hardy variety that bears consistent crops even in wetter soils. Has one of the most low and spreading forms of any Northern Highbush. Patriot has excellent ornamental qualities with its showy white blooms in spring, dark-green summer foliage and fiery orange-red fall colors, making it great in the landscape and in containers. Our berries are fruiting now, come in and make your selection today! Nothing says spring like the wonderfully fragrant blooms of lilac! Growing into a large shrub, lilacs bloom in many colors, ranging from white to lavender to purple. Although they bloom only in spring (often around April), they are attractive the rest of the growing season, with large heart-shaped apple green leaves which drop cleanly in fall. Plus our favorite part - they’re deer resistant! Although we all know a hungry deer will try almost anything! Plant lilacs in full sun to very light shade. Many varieties of lilacs need a substantial winter chill to bloom well, and do great in most of central Contra Costa County. For our customers in warm winter areas, such as Alameda County, we recommend low chill varieties, such as Angel White, Blue Skies and Lavender Lady. 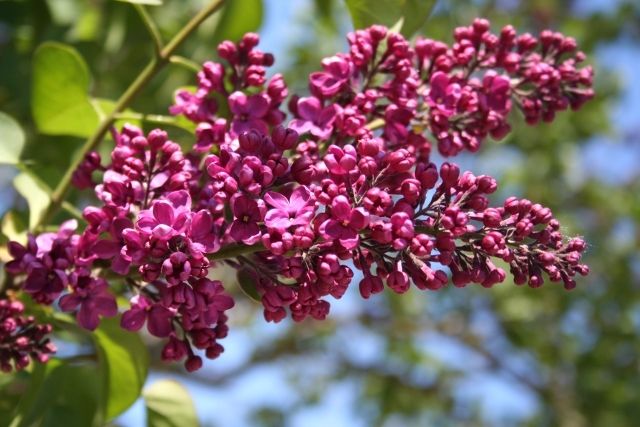 Lilacs are drought resistant once established and need only light pruning right after bloom (pruning later can remove developing flower buds). They require only occasional feeding. We recommend fertilizing once with Master Nursery Multi-Purpose Fertilizer 16-16-16 after bloom and once with Master Bloom 0-10-10 once in fall. During the rainy season, we treat our budding lilacs every 3-7 days with Monterey's Complete Disease Control to protect beautiful blooms from blight! Find this organic control in our Garden Shop. See below for images of some of our varieties available now, and what to expect upon flowering! Plant now and you’ll have fragrant bouquets like these come spring! Questions? Stop in today and let's talk lilacs!